Maddie is a seriously well-traveled coonhound. In 2011, few months after she was adopted by her owner - former fashion photographer Theron Humphrey - she road-tripped more than 65,000 miles. Theron Humphrey on Instagram: "Breaking bread around the holidays with your friends and family always feels right. Cheers y'all"
Humphrey had just successfully funded a yearlong, Kickstarter-funded project to photograph and interview people across the country. Theron Humphrey on Instagram: "Hm. Does not like to share. In Aspen all week! â·"
The project, This Wild Idea, now had a companion and mascot - Maddie, who soon become its beloved star and changed her owner's life. One day Humphrey photographed her on top of his truck, posted the pic to Instagram and the crowd went wild. Theron Humphrey on Instagram: "Cabin mornings âï¸"
Her elegant physique, calm demeanor and sweet face made her a great model. The photos soon turned into a series and then a book, "Maddie on Things: A Super Serious Project About Dogs and Physics." Theron Humphrey on Instagram: "Getting up early around these parts never disappoints"
"Dogs make any life journey more rich," Humphrey has said. He's since started Why We Rescue, an audio/visual project talking to dog adopters about their stories and photographing them with their pooches. Theron Humphrey on Instagram: "Portrait of Maddie, NYC, Nov. 2015. I don't shoot with artificial light often buts it's good to flex your wings, try something new, and be..."
Meantime, Maddie and her owner are still taking and posing in photos-and changing each other's lives. Theron Humphrey on Instagram: "Raise your hand if you wanna help me stack this cord of firewood! 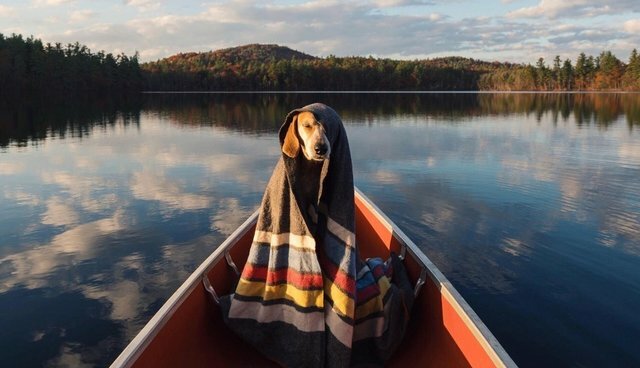 âð¼"
Theron Humphrey on Instagram: "Little bit of autumn in NYC ð"
Theron Humphrey on Instagram: "November is gonna be amazing, feeling v blessed â¡ï¸ I rented a tiny cabin right on a pond in Maine (stocked with this canoe! ), I'm heading..."
Theron Humphrey on Instagram: "I'm reading this book right now called Scary Close, by Donald Miller. Talk about words hitting you just at the right time." Theron Humphrey on Instagram: "My daily editing desk. Pretty simple setup: 1 snuggle bunny, 13" Mac air, power inverter, camera and a few lenses. Trying to keep it simple..."
Theron Humphrey on Instagram: "Dogs are this wonderful reminder of our daily blessings. We so often forget that our good health is such a gift...and that we don't need..."
Theron Humphrey on Instagram: "Typical. Headed towards Marfa for a little video project next week â¡ï¸"
Theron Humphrey on Instagram: "Reason # 11 why you should travel with a dog: built in breakfast tray ð³"
Theron Humphrey on Instagram: "There's a deep joy to be found camping out on your own slice of land â¡ï¸"